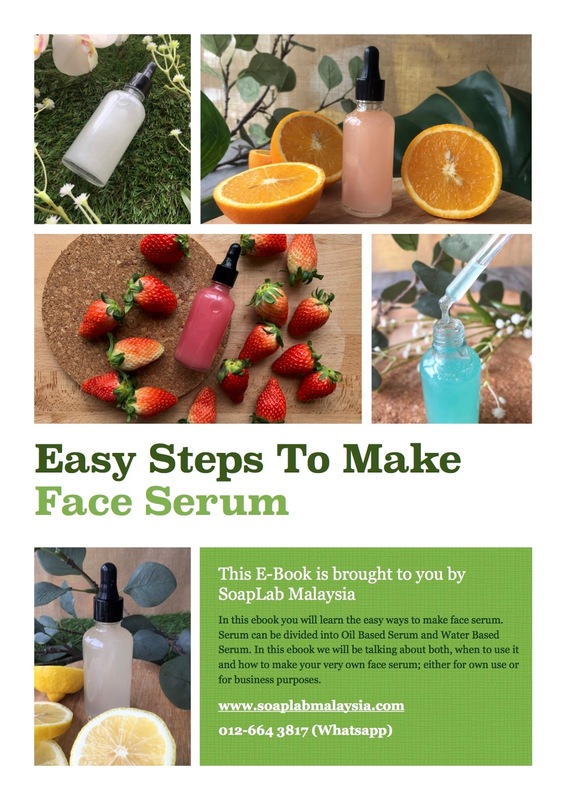 SoapLab Malaysia: What is Serum? And How To Use & Make it In Malaysia? What is Serum? And How To Use & Make it In Malaysia? Face serums are lightweight moisturisers that penetrate deeper to deliver active ingredients into your skin. Serums are used after cleansing and toning, but before using your choice of a moisturiser. I like to apply mine right after I tone, leaving my skin slightly damp. Serum can be divided into two categories; Oil based, and water based serum. Oil based serums leave you with an instant glow, very moisturising but can get sticky while. Water based serums have a lighter gel like texture and absorb quicker into the skin for active ingredients tto work fast! Water based serums usually contain a base of water or aloe. These products are targeted for high amounts of vitamin c or hyaluronic acid. Both ingredients are water soluble, meaning it can pass through the skins barrier with ease. SoapLab's Handmade Serum base is made with the maximum amount of hyaluronic acid so that your skin gets the most out of this 'super moisturiser'!. This naturally occurring polysaccharide has the ability to absorb up to 1,000 times it’s weight in water, and when applied on face; it can help skin hold in moisture and feel more supple. Oil based serums often contain a base of argan, jojoba, or avocado oil. These oils protect your skin’s barrier from pollution, UV damage, and dry environments. They can contain essential oils, superfoods, and a variety of botanicals. This product can be used either day or night depending on when your skin needs more moisture. If you tend to be on the dry side or have dry patches, using this type of serum both day and night may be best. If you want a more luminous look add a couple drops to your moisturizer or foundation to ensure glowing skin that lasts all day! Oil based serums can be great for all skin types prone to acne and oil. Don't be afraid to mix oils with oily or acne prone skin. Meet argan oil, your new best friend! With a comedogenic rating of zero, argan oil is less likely to cause breakouts, extra oil production, or irritation. You can add this oil with ease and open yourself up to a whole new world of products! Depending on your skin as both are perfect for both extreme of skin: dry and oily so its really up to you. But if its up to me; I use water based serum in the morning, and oil base at night. This routine fits perfectly for my combination skin type. Try it out if you have skin like mine! So How Do you make a serum? You can either make serum from scratch or get the bases. In these recipes ill be sharing here; all the serums are made using SoapLab’s Hyaluronic Acid Serum Base. These bases are lab tested and have shown to be stable for 12 months when handled properly. We have also tested this serum base on various human skin; and there was no skin reaction caused by this serum base. What Can We Add Into Serum base? You can add up to 1% of Fragrance Oil or Essential oil in the serum for scent purpose. We do not encourage you to add more as the scent can be overwhelming for you in the long run. Botanical or fruit extracts are the next ingredients that people love to add into their serum. Depending on the purpose you are looking for (as attached in the ebook); you can add up to 0.5% of the extracts into the serum. Please be aware however that by adding extracts into your serum; you need to finish it with 3-6 months as the serum can spoil easily with addition of extracts. Extracts are great addition to serum. However; it can only be added into water based serum. Its not suitable to be added into your oil based serum because it doesn’t mix well. Unless you are adding it to infuse the oils with these extracts; don’t add this into you oil based serum. Colors are added to give the illumination/ bronzing effect to the user. You can also add oils into these serum. However; because the serum is water based serum, adding oil will cause the oils to float on the surface of the serum. You have two alternatives to this. you could add polysorbate 80; a light emulsifier that will help to mix the oil with the serum. Adding oils into oil based serum is not a problem at all..